The contemporary three-bedroom, three-bath home was built and designed by a builder for himself in 1984. The home was designed using an array of woods that can be found across the country. 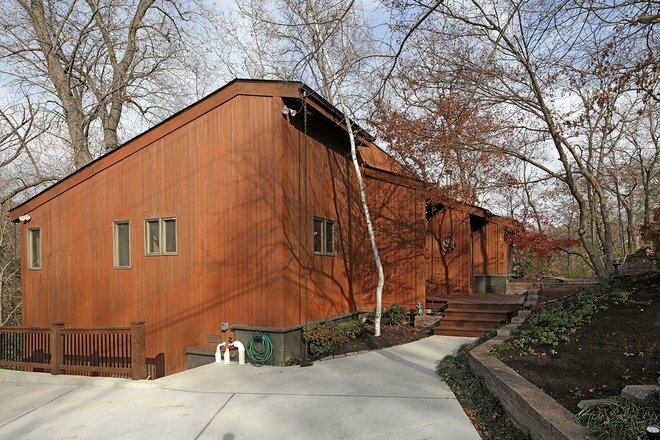 The property itself was built using Redwood. The exposed wood beams scaling the ceiling are reclaimed Spruce from a warehouse in Soulard dating back to the early 1920’s. The wood paneling above the fireplace is made using Cypress, the trim and kitchen cabinets are Hickory, while the dining room floor was built using Elm. Natural light fills the open-floor plan through numerous custom skylights found throughout the home. Wood-burning stoves are located in both the master bedroom and the upstairs sitting room. The kitchen comes complete with high-end appliances like the Sub-Zero refrigerator, and features a breakfast table surrounded by windows. Outside, multiple decks line the exterior of the home—each offering views of the nearby creek and woods. A few of the impressive Oak and Hickory trees surrounding the home are lit up at night for viewing. The fire pit area is ideal for entertaining. Address: 232 S. Ballas Rd.